My second semester as a Third year Journalism student had finally began. (That means that my blogging time will be lessened because of school works.) And with that, I ended my semester break by going back to my third love (because my first and second love is reading and writing.) which is crafts! Seriously, you can cut my two feet, but definitely not my hands. Of course, it would be better if my body parts are complete, though. Just saying. I’ve been Introduced to crochet six years ago. My mom taught me how to do simple chains. I made numerous bracelets from chains and give it to my classmates. Soon, my mom taught me how to make pouches so I made numerous crochet pouches. Funny, because Every single pouches at home back then is crocheted. From there, I’ve learned how to make a hole, a heart, granny squares, and so on. 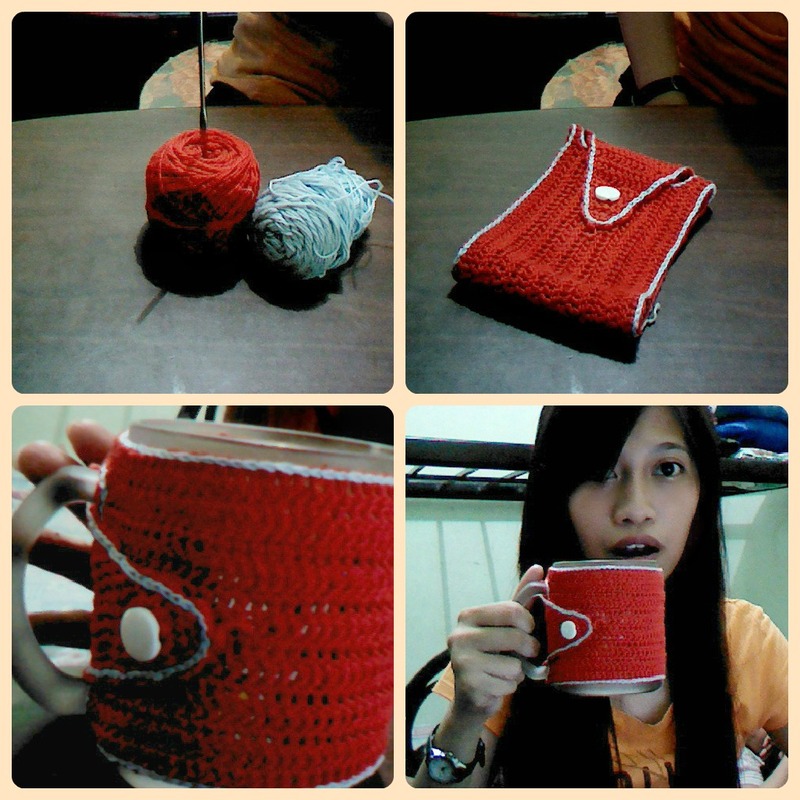 And this semester break however, I did a *drum roll please* coffee mug sleeves! Isn’t it kind of annoying when its so cold outside and you want a coffee so you make one and you put your hands around the mug but the mug is as hot as hell? sounds like my problem. Philippines is a tropical country. It’s so hot in here but when it’s raining or the “ber” months are coming , my bones are surely freezing, I don’t know why. and I made this mug sleeve to save me from super duper ultra mega hot coffee. I can still hold my coffee mug, without damaging my hands. I use a red yarn and overlay it with light blue yarn to make the outline. 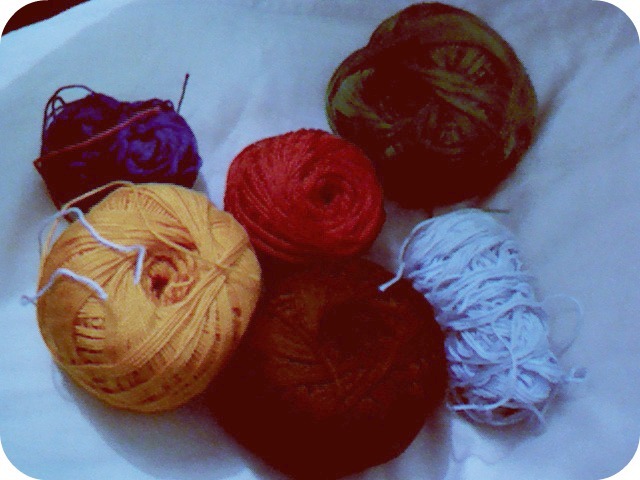 I would love it to be orange but I have no other yarns but red, green, blue and light blue. I used hook no. 7 as my tool. My yarns are from Monaco. They produce yarns with vibrant colors. Here they are, orange and brown are the new additions to my scarce supply of yarns. Hooks differ in number. 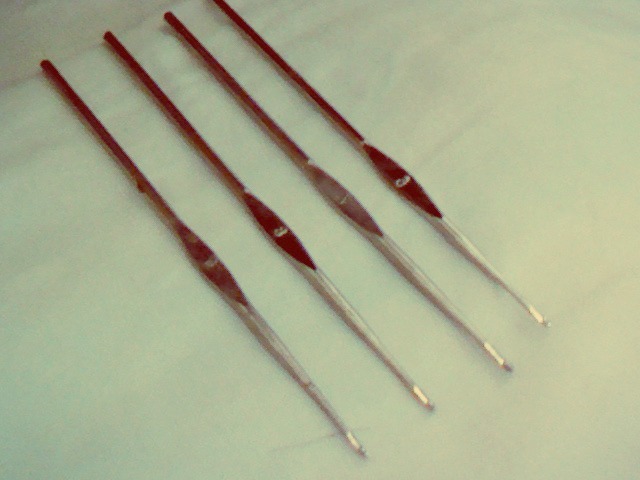 the bigger the hook number, the smaller the tip, and the smaller the number, the bigger the tip. That’s why with these yarns, I use hook no. 7. You can use hook no. 8 or 9 too, but it will be tight and hard to manipulate. hook no. 6 on the other hand, will make the stitches a little loose. I’m sorry, I didn’t take any photographs while doing this, so I can’t explain the pattern clearly. Next time, when I do another mug sleeve (An Orange one!) I’ll make sure to take some pictures or make a video.